Gas vs. Electric Air Compressors – What to Choose? Apart from the usual considerations, you will also have to choose between a gas-powered and an electric air compressor. Now I would like to be clear, both of these will do their job fine and there are no major differences in terms of performance between the two. However, they are different in several aspects and each type has its pros and cons. As usual, I’m passing on what I’ve found out to you. Let’s hope you find it helpful. Gas-powered compressors use gasoline to generate power which is kind of stating the obvious! So why would you go with one of these instead of the electric type? There are several reasons. The main reason is the lack of an electrical hookup of some sort. Also, if the location where you need to use the compressor is distant you may have to use an extension cord, and some electric compressors may not be able to function that way. With gas compressors, you simply fill up the gas tank and do the job. Another difference is the non-existence of an automatic mechanism which powers up or shuts down a gas compressor. Instead, they have a pilot unloader valve which opens and closes depending on the pressure inside the tank. This basically means that gas compressors operate continuously, making them ideal for the type of work where continuous pressure is required. In fact, they tend to feature heavy-duty design, and are generally meant to be used for heavy-duty jobs. 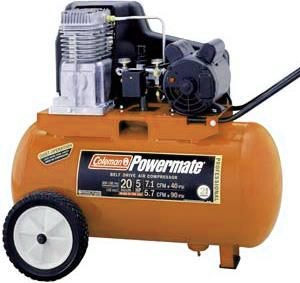 However as much as gas compressors are awesome when used outdoors, they cannot be used indoors. Outside, noise and fumes that gas compressors produce are not much of a problem, but inside inhaling those toxic fumes is dangerous. Also, there is the issue of safety. Gasoline is highly flammable which means you must be 100% dedicated to proper maintenance. If you can do that, you have nothing to worry about. Another drawback is these compressors tend to be massive which can make the entire transportation process somewhat of an issue. 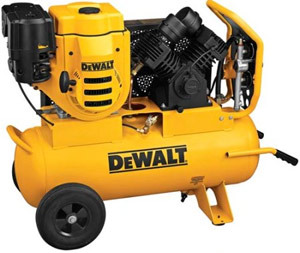 Electric air compressors are more common than their gas-powered counterparts. They also tend to be easier to use in terms of convenience, and generally cost less money. If the job site has a power outlet you are better off with an electric compressor. So far, we have learned that gas compressors are bulky and heavy, and electric models tend to be quite the opposite. They are smaller, lighter, and come in a variety of different styles and sizes which makes them highly versatile. Also, the majority of electric compressors have the aforementioned “start-stop” switch which shuts down the motor when the pressure inside the tank reaches its upper limit, or starts it up when the pressure drops below a specific value. The switch will also do the same when there is no power tools attached to the compressor itself. The most obvious drawback of an electric compressor is the fact you can’t use it with an extension cord. No matter how powerful, any electric compressor is going to be useless if there is nowhere you can plug it in. Also, they tend to be inferior at heavy-duty jobs, but excel at trim and finish work as well as all indoor repairs. So there you have it! Gas Vs Electric air compressors, and as usual the choice is up to you but hopefully the information above has gone some way to helping you make a decision.